The M-40 Full Facepiece has been used for years by U.S. Armed Forces all around the world. It has been modified by 3M for easier breathing and is now available for CBRN applications. The 3M Full Facepiece FR-M40B and FR-15-CBRN filter meet the new NIOSH standard for CBRN applications and deliver confidence and reliability to First Responders. It provides a comfortable, efficient, and reliable solution when it's most important—when lives are at stake. This lightweight CBRN system has been tested by NIOSH against the most common warfare agents including sarin, mustard and numerous industrial chemicals, and meets the P100 particulate filtration efficiency standard, making it one of the most versatile pieces of equipment for First Responders. The dual ocular lenses offer a wide field of vision for increased wearer comfort and safety so Responders can have excellent visual capabilities. Voice communication is made clearer with two integral speaking diaphragms. Patented filtration technology used in our canister results in the optimum combination of easy breathing, lighter weight, service life and general comfort. Soft silicone face seal means a better fit and increased comfort. 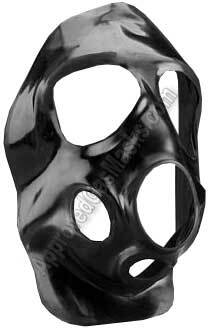 Butyl rubber second skin provides enhanced permeation protection, which means greater user security. Two integral speaking diaphragms allow clearer communications. Canister can be mounted on either side of the facepiece for easier, more accurate weapon sighting. Drinking tube connection for use in non-contaminated areas. Assembled with second skin and eyepiece outserts in place. Just attach the 3M™ Canister FR-15-CBRN and you have a CBRN approved system. 3M Safety Products have been an integral part of First Responders’ overall preparedness for decades. Responders have depended on our technology, service and support around the world and in the U.S. at various times including Mount St. Helens, Oklahoma City, 9/11, the Anthrax scare, SARS and even as recently as the 2003 California wildland fires. This new 3M full facepiece FR-M40B and the 3M™ Canister FR-15-CBRN are state of the art quality you can depend on.Comes with several unique design features suited for first responders. The silicone allows for excellent fit testing results and maximum comfort while the optional butyl rubber second skin protects the facepiece increasing respirator life and decreasing decontamination costs. A butyl coated nylon hood covers the head and neck and is easily donned to add additional protection against chemical agents and meets MIL-SPEC-C-51251. An integral drinking device permits the user to replenish fluids without having to remove the mask. 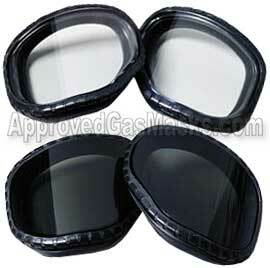 A dual eyepiece format permits the respirator to easily interface with optics and to fold for storage. FR-M40 accessories include: clear and gray eyepiece outserts, spectacle kit, and buytl rubber Second Skin. The FR-M40 fits into a storage bag/carrying pouch with strap. increasing respirator life and decreasing decontamination costs. M40 Second Skin: $48.90 - Included in above kit! Protects primary lenses from scratch and damage, thus prolonging the life of the 3M™ Full Facepiece Respirator FR-M40. Easily snaps on over lenses. Tinted eliminates sunglare. M40 Lens Covers - Clear/Tinted: $96.50 - Included in above kit! A butyl coated nylon hood which covers the head and neck. 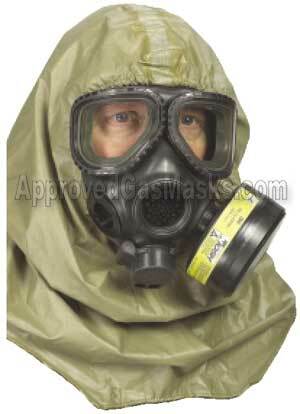 It is easily donned to add additional protection against chemical agents and meets MIL SPEC-C-51251A . For M40 mask only. 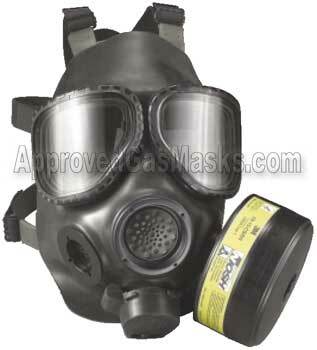 full facepiece respirator. User must have prescription lenses fitted into the frame. A single DIN threaded cartridge that has the brand new NIOSH CBRN approved filter providing first responders with effective respiratory protection against chemical, biological, radiological and nuclear (CBRN) agents that might be used in a terrorist attack. 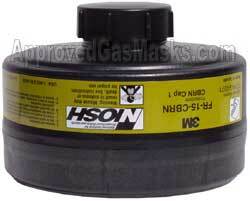 More on the CBRN gas filter.